Rob Ford, one of Toronto’s most prolific and polarizing mayors and councilors, has passed away at the age of 46. Ford was pronounced dead at Mount Sinai Hospital Tuesday morning after battling a rare and aggressive form of cancer called pleomorphic liposarcoma since 2014. 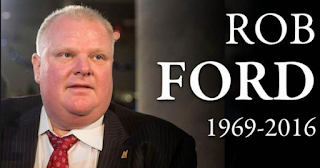 “With heavy hearts and profound sadness, the Ford family announces the passing of their beloved son, brother, husband, and father, Councillor Rob Ford earlier today at the age of 46,” his family said in a release. As a councillor who represented Etobicoke for more than a decade, and for four roller-coaster years as mayor, Ford was remembered as “above all else, a profoundly human guy.” He died Tuesday morning 18 months after he was diagnosed with a rare and aggressive cancer. Ford’s council colleagues, many who once turned their backs on him in the council chamber after he refused to seek help for substance abuse, confined their reminiscences to his behind-the-scenes grace, kindness and commitment to his constituents. According to family, Ford was recovering after becoming “very weak” from previous treatment and was under 24-hour medical watch before his death. “The family asks that you respect their privacy and join them in their grieving and their prayers,” the release states. Flags at City Hall, Metro Hall and Toronto civic centres have been lowered to half-mast, and will remain that way until Ford’s funeral. Books of condolences are at Toronto City Hall and at civic centres, as well as an online one.